We've collated answers to the most common questions we're asked regarding the ordering, installation and maintenance of our Wildflower Turf. If you'd like further information then please contact us on +44 (0)1522 704949 or via email at sales@tillersturf.co.uk. How do I order my wildflower turf? Once you have selected a suitable product please contact our sales team for a quotation or to place your order. Once ordered, your chosen turf should, in most cases, arrive by 10am the day following harvest. Our wildflower turf is harvested all year round, with the exception of adverse weather conditions. Please note that all our products will be subject to availability at the time of ordering. ​How do I prepare the ground? Prepare a clean soil bed by lightly cultivating or importing and spreading a low fertility soil. If cultivation is not possible. e.g. on a steep bank, achieve bare soil by spraying off any existing foliage and cutting any remaining vegetation as tightly to the ground as possible. It is important that any arisings are collected and disposed of responsibly. We strongly advise that the area is fully prepared before ordering your turf. How is the wildflower turf delivered? The turf will be delivered stacked on a pallet rather than rolled. Each individual wildflower turf slab measures 1200mm x 600mm and weighs on average 15-20kg. Depending on the delivery method there will be 30-50sq/m of turf per pallet. When ordering please make our sales team aware of any potential delivery challenges e.g. limited access or poor ground conditions so we can advise a suitable delivery and offload method. Once delivered it is important to ensure you have sufficient labour force to install the product. How do I lay my wildflower turf? It is advisable to lay on the day of delivery and if possible to avoid double handling the turf. If it is not going to be laid straight away it is advisable to lay the turf out in another area and keep moist until ready. To lay, place the slab on to the prepared ground and gently press to form a contact with the soil. It is advisable to start by laying out a perimeter to form the shape of your wildflower area and then infill using a "laid brick" formation. The turf can be carefully cut using a sharp knife or saw. Any off cuts or leftovers will contain valuable wildflower plants and can be used to infill or be transferred to another area of the site. If installing on a slope the turf should be pegged to the bank using degradable pegs (available to order), using a minimum of 3 pegs per slab. Once the turf is laid please dispose of any pallet wrapping responsibly. How do I grow in my wildflower turf? Once laid, your turf may take on a "flattened" appearance; please don’t worry as it will soon recover. It will be very important for the first few weeks to ensure sufficient water is applied until the roots have firmly tapped into the soil. Your wildflower turf will not require any nutrient input, such as fertiliser. The degradable, recycled carpet fibre matting the turf is grown on will also act as a weed suppressant. Therefore, the re-emergence of indigenous soil species should be minimal and because the turf contains mature plants the area will establish very quickly and outcompete many non desirable species. Will I see all the wildflower species listed in my turf? 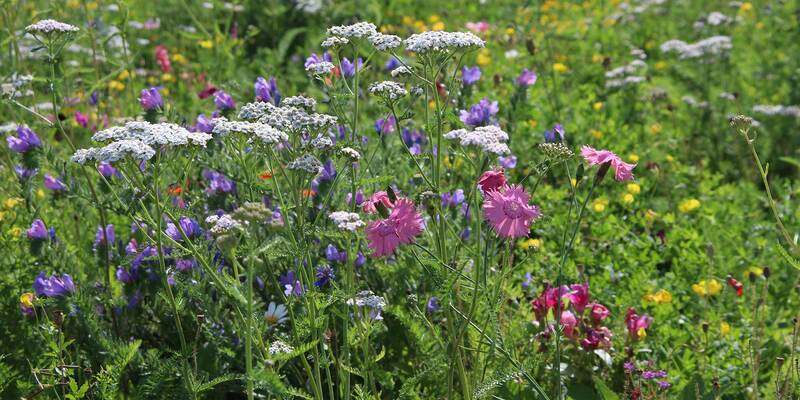 It is very unlikely that you will encounter all of the species listed within our wildflower turf products. Our bespoke mixtures have been developed to ensure that the product will establish in a wide variety of soil, environmental and climatic conditions. Therefore, site specific conditions will dictate how many of and which species are successful. Many of our mixes also contain a small proportion of annual species e.g. cornflower. The number of annual plants within the mixes will reduce as the more sustainable perennial species establish themselves in year two. Will my wildflower turf contain other plant species? Every effort is made to ensure your wildflower turf is delivered with as little undesirable weed content as possible. However, it is inevitable that some opportunist species may be present or germinate after your turf has been laid. Most annual weed varieties will either be outcompeted by your meadow or will not survive the management cutting process. It is the more competitive perennial broadleaf weeds which you will need to control e.g. docks, thistles and broad leaved grasses. If you notice any of these species whilst you are enjoying your meadow then you can either spot treat using an appropriate product or preferably pull out by hand, negating the use of pesticide. What wildlife will my wildflower turf attract? Once your turf is laid you shouldn’t have to wait too long for nature's first beneficiaries. Your wildflowers will provide a vital source of nectar for many of our native pollinating bee and butterfly species. Alongside these you should look out for daytime flying moths too e.g. the silver “Y” and the attractive six spot burnet. The additional grass stems in our Flora Meadow and Flora Aqua mixes create ideal perching spots for soldier beetles, grasshoppers and many other species. It’s not just the flowers and stems that are beneficial, the dense canopy of plants will also provide a safe refuge for small mammals, frogs and toads. What management will my wildflower turf require? To keep your wildflower meadow healthy and sustainable it will require careful management. One key task is an end of season cut and collect to remove any dead or woody growth and help to promote new growth of desirable plant species. The cut can take place any time after flowering has finished and seed has set. A Summer cut can be made if a particular species is dominating to the detriment of other species. It is very important following any cut that arisings are collected and removed from the area. This will prevent smaller plants from getting "smothered" and reduce the risk of nutrient production from the decaying plant matter. For smaller meadows, you can cut using a hedgecutter or strimmer blade. For larger meadows you may require a tractor with a flail collector attachment. Whichever method you use be sure that all cutting edges are sharp. Always aim for a final cutting height of approximately 100mm.